Soccerween tournament at Batavia Sports Park this Halloween weekend ! In the mood to see ghosts, vampires, and zombies this weekend? Then stop by Batavia Sports Park on Bank Street Road for the third annual Soccerween Tournament sponsored by New York Premier Soccer. Games start at 8 a.m. and continue until 4 p.m. Teams typically choose a theme and each player dresses accordingly. Trophies are awarded for Most Creative Costume and Best Dressed Teams/Coaches. New York Premier Soccer organizes this event for travel- and premier-level teams. Each team is guaranteed at least three 7v7 or 9v9 games in a one-day tournament format. Turf Specialist Recommends Natural Approach When Growing Fall Grasses ! All-natural compost and water conservation agent promote healthy soil and grass growth . . . . . .
(O’Fallon, IL, Oct. 16, 2013) – Most of us already know, whether you’re a turf specialist or an enthusiastic gardener that renovating and growing sustainable grass can be tricky… and even downright frustrating. James Rafferty, horticulturalist and owner of Lawn Wranglers of Belleville, IL , says using compost and all-natural water conservation agents while seeding, sodding and growing lawns is the key to a positive end result. Rafferty says it’s all about making the soil healthier, to aid in the growing process of the lawn. Adding organic products to the soil will help the lawn better sustain itself over the long term. Although still a relatively new science, the use of an all-natural water conservation agent when seeding or sodding a lawn can help to significantly reduce the amount of water, energy and fertilizer needed to grow a healthy turf, he said. Formulated from a blend of desert plant extracts, H2OExcel acts to naturally reduce soil surface tension to allow soils to absorb water three to five times faster. Use of the product also alters the soil profile to allow fertilizers, nutrients and oxygen a more efficient path to the root zone. “H20Excel adds a much needed food source for the recently introduced microorganisms and moves nutrients from the compost, through the soil to the plant roots. I was excited to find an all-natural water conservation agent in H20Excel that improved our organic processes,” he said. When is the right time to sod or seed a lawn ? Rafferty recommends planting grass seed or installing sod in the fall when the ground is warm and the air is cool. Optimal air temperature is 75 degrees and above during the day and below 70 degrees at night. Preferably begin the process before the leaves have begun falling from the trees and just after a good rain, when the soil is soft. How do you prepare the soil ? Aeration, power raking, tilling and slit seeding are all good techniques for disturbing the soil and removing debris and dead grass. Rafferty recommends incorporating compost to the prepared areas at this time, to provide much needed nutrients to the soil and prepare it for germinating seed and growing grass. How do you know which type of grass to grow ? • What will the turf be used for(athletic games, beauty, filling bare patches, standing up to high traffic) ? • How much sun or shade does the area get ? • Do you want the grass to thrive in a cool climate (Kentucky Blue Grass, Tall Fescue Blend) or a warm climate (Zoysia, Bermuda) ? • What is my budget? Sod, rolls, seed and plugs have different price points. What do I do after the seed or sod is laid down ? Rafferty recommends using compost instead of straw to cover the seed after it has been distributed. Compost can hold six times its own weight in water, provides nutrients to the soil, breaks down thatch buildup and is weed free, unlike straw. Rafferty recommends using H2OExcel, which is diluted with water, on new sod and seed at the time of installation. H20Excel will help germinate the seed and root the sod more effectively with less water, he said. “The use of H20Excel this summer on stressed , newly sodded lawns improved the areas significantly. We thought we were going to lose some installed turf this summer from a late drought. It didn’t seem like the homeowners could apply enough water. We applied H20Excel and saw a significant improvement in growth and color,” he said. New sod and seed should be watered once or twice a day. Rafferty recommends watering enough to keep the sod and soil wet, being careful not to cause pooling of the water. Watering too much can be more detrimental than not watering enough, he said. Watering in the morning is optimal, but hotter days may require additional frequency. Removing falling leaves from newly seeded or sodded areas will protect the new growth from being smothered and give it a better chance to grow. Is There an Exception to the Dram Shop Rule ? Loss of Support and Loss of Services Claims Under the Dram Shop Act ! At common law, one who provided intoxicating liquor to an intoxicated person was not liable for injuries caused by that person, who was solely responsible. First-Party Recovery Under the Dram Shop Act ? Fundamental to the imposition of Dram Shop liability in New York is that the statute protects only third parties and does not create a cause of action in favor of the individual whose intoxication resulted in his or her own injuries, to wit, firstparty liability. See Sheehy v. Big Flats Community Day, Inc., 73 N.Y.2d 629, 541 N.Y.S.2d 18 (1989), which found that the plaintiff, whose injuries emanated from her own intoxication, had no cause of action under the Dram Shop Act and held that “the courts of this State have consistently refused to recognize a common-law cause of action against providers of alcoholic beverages in favor of persons injured as a result of their own voluntary intoxication.” Further, even if the intoxicated person causing his or her own injury was underage at the time of service, there would be no Dram Shop liability. Although an individual who is injured because of his or own intoxication cannot recover for those injuries under Dram Shop, both GOL §§ 11-101 and 11-100 allow for claims by parents for loss of economic support arising from injuries sustained to their child as a result of his or her own intoxication. Each provision reads that “Any person who shall be injured in person, property, means of support or otherwise . 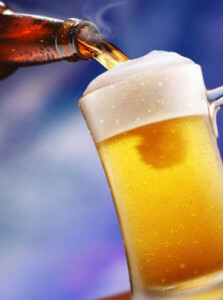 . . as a result of a reasonable connection between someone’s consumption of alcohol and the accident, is entitled to pursue a claim under provision.” Subsection (4) of each provision specifically gives a parent that right of recovery. It is often argued by plaintiffs’ attorneys that a parent’s right to recover should not be limited to loss of support and expenses but, in fact, should be expanded to include loss of consortium, which would include loss of services. This last point is usually the most contentious. Loss of Support and Loss of Services ? So, what exactly is a parent’s right of recovery under GOL §§ 11-100 and 11-101? Is a parent entitled to recover not only for documented loss of economic support, but also for the more vague and less-defined loss of services? Our answer is that recovery is limited to loss of support and expenses; and that is what this article will discuss. It is without question that a parent’s right to recovery includes loss of support and expenses (related to medical care and funeral expenses) incurred in connection with the injuries and/or death of their child. This right of recovery is not automatic and relies on whether the plaintiff is able to submit evidence to establish actual loss of economic support. Although this question can be the subject of dispute, it is more common to see litigation over whether there will be Dram Shop liability for loss of services, which is the economic part of a loss of consortium claim. Specifically, it is argued that although neither §§ 11-100 and 11-101 specifically allow recovery for loss of services, the phrase “or otherwise” is expansive enough to allow the courts to sustain this claim. The courts in New York have repeatedly rejected this argument. To understand the reasoning behind the rejection of this argument, one must start from the beginning. The Development and Evolution of Dram Shop Liability in New York ! The Dram Shop Act was originally entitled “Civil Damage Act” (L 1873, ch 646) and, in an 1878 Court of Appeals decision entitled Volans v. Owen, 74 N.Y. 526 (1878), the Court, looking at the legislative purpose, construed the statute narrowly. In Volans, the plaintiff, a 20-year-old male, was injured when he became intoxicated and fell. As a result of his injuries, he was unable to work on the farm owned by his father, the plaintiff. In addition, the father paid medical and other expenses to care for his son. It was argued that this rendered the father’s means of support inadequate. Essentially, the Court of Appeals refused to consider the services that the son provided on the farm prior to the injuries he sustained as a result of his intoxication. In addition, the Court of Appeals established a higher burden of proof to sustain a claim under loss of support. That is, a plaintiff had to show that not only did he lose support, but was also reduced to a state of dependency from that loss. Over the next 100 years, the provision was amended and eventually retitled Dram Shop Act, and the language of the statute changed to what we now know it to be today. While the issue of entitlement to loss of support was on occasion litigated, Valicenti v. Valenze, 108 A.D.2d 300 (3d Dep’t 1985) 108 A.D.2d 300, 304 (3d Dept. 1985) aff’d as modified, 68 N.Y.2d 826, 507 N.Y.S.2d 616, 499 N.E.2d 870 (1986), would become the case that not only changed the interpretation of the “Dram Shop Act” but also tested the waters for a loss of services claim. In Valicenti, the plaintiffs, a father and child, commenced an action under General Obligations Law §11-101(1)(4) seeking recovery for loss of services and loss of support. The case involved the death of the plaintiffs’ wife and mother caused by her own intoxication. Discovery showed that the mother had left her family approximately 10 months prior to her death, was not contributing to the household and was actually being partially supported by the plaintiff husband. Defendants moved for summary judgment, relying principally on Volans, supra, arguing that the plaintiffs had failed to demonstrate that they were accustomed to receiving support from the mother and, because of her death, were reduced to a state of dependency. Further, defendants argued for the dismissal of the loss of services claim because the Dram Shop Act did not allow for such a recovery. The Appellate Division, Third Department refused to adhere to the 107-year holding of Volans and apply a restrictive interpretation of the Dram Shop Act. The court reasoned that the law had evolved over the years, and the legislative purpose had also changed. Thus, relying on a more modern interpretation of legislative purpose and recent case law, the court held that, although the mother had not provided any support to the family for 10 months, since she was “directly chargeable by statute for both spousal and child support,” the issue of loss support must go to the jury for determination. Id at302. Importantly, the Appellate Division took it one step further and held that the 1921 legislation which extended liability under the Dram Shop Act allowed “the Valicenti children . . . the opportunity to recover damages representing the economic worth of the loss of their deceased mother’s parental services, such as care, guidance, education and training.” Id at 305. Notably, Justice Kane, dissenting in part, did not agree that the legislature, by using the words “or otherwise,” “intended to overrule the well-established common-law rule that would not allow recovery for loss of consortium” between a parent and a child. On further appeal, the Court of Appeals modified the Appellate Division order and dismissed the plaintiffs’ claim seeking economic loss of consortium. 68 N.Y.2d 826, 507 N.Y.S.2d 616, 499 N.E.2d 870 (1986). The Court noted that while the legislature may have created a new cause of action through the Dram Shop Act, it did not alter the rules of damages. Thus, although the Court agreed with the Appellate Division that “loss of support” should not be so narrowly construed and, ultimately, a jury could consider “both the evidence of the support of the decedent provided to the plaintiffs before her death and evidence of support the plaintiffs could reasonably have expected but for her death”; it also held that “or otherwise” did not include claims for loss of consortium, economic or noneconomic loss. Since such a recovery is not specified in the statute, any change would need to come from the legislature and not the courts. Id at 618. Valicenti remains the law in New York with respect to the recovery of loss of services under a Dram Shop claim. A plaintiff, whether a parent or a child, cannot recover for loss of services arising from the death of a parent or child caused by anyone’s intoxication — that of the decedent or a third party. The only first party recovery permitted under a Dram Shop claim remains loss of support and expenses, and such claims are often difficult to establish. A common example of such a difficult claim is where the plaintiff is a parent seeking loss of support for the death of a child who had no legal duty to support the parent and did not support the parent during his or her lifetime. See McNeill v. Rugby Joe’s Inc., 272A.D.2d 384, 707 N.Y.S.2d 483 (2d Dep’t 2000)(parents’ claim for loss of future support dismissed finding that the decedent, the plaintiffs’ 20-year-old son, had no legal obligation to support his parents nor had he undertaken a duty to provide such a support); Gigliotti v. Byrne Dairy, Inc., 249 A.D.2d 973, 672 N.Y.S.2d 172 (4th Dep’t 1998) (holding that there was no evidence that the decedent, a 17-year-old boy, supported the plaintiff or that the plaintiff anticipated her son’s support in the future). Although a parent is no longer required to demonstrate that he or she was reduced to a state of dependency because of the loss of his or her child, it remains difficult for a parent to establish a claim for loss of support, particularly where the child was dependant on the parent at the time of his or her death or injury. The evidence of support or future support is often nonexistent, and, even if such claims survive dispositive motions, it is difficult to determine their value. While a bill is pending in the New York Senate to amend the GOL§ 11-100 (which establishes liability for the sale of alcohol to minors)2 to hold liable those who provide false identification to individuals so that they may procure alcohol, there is no indication that the legislature is considering amending the Dram Shop Act to allow recovery for loss of services. As the Court of Appeals stated in Valicenti, without such legislation,there will be no change in the status quo. ASA/USA Softball awards Charlie McVay Softball Complex the 2013 ASA Complex of the Year ! OKLAHOMA CITY — Following the city of Roswell’s efforts to provide much needed upgrades to their softball facility, the Charlie McVay Complex in Roswell, N.M., has been selected as the 2013 Amateur Softball Association (ASA) of America Complex of the Year presented by Stabilizer Solutions, Inc., ASA/USA Softball announced today. In addition to receiving the award at ASA’s 82nd National Council Meeting in Oklahoma City, Okla., the Charlie McVay Complex (1500 N. Grand) will also receive approximately $2,000 in field maintenance products from Stabilizer Solutions. Previous award winners include the Botetourt Sports Complex in Botetourt County, Va. in 2012, the James I. Moyer Sports Complex in Salem, Va. in 2011, Veterans Park and Athletic Complex in College Station, Texas, in 2010, Heritage Park Softball Complex in St. Joseph, Mo., in 2009, Twin Creeks Softball Complex in Woodstock, Ga., in 2008 and Freedom Ridge Park Complex in Ridgeland, Miss., in 2007. The Field of Dreams Complex in Las Cruces, N.M., won the inaugural 2006 award. Previously known as “Wool Bowl Softball Complex”, the facility was completely torn down and built from the bottom up to provide a first-class facility for softball athletes. In addition to new sod and dirt on each field, new irrigation systems, fencing, concession stands, dugouts and restrooms were added during the overhaul. The complex also received brand new lights and scoreboards for each field. The New Mexico ASA hosted an opening ceremony tournament June 21-23 at the renovated complex, in which 34 teams participated. At the conclusion of the tournament, the fields were closed down for the remainder of the year to allow relief for the newly minted sod on the fields. Dedicated in memory of Charlie McVay, a former ASA coach, the city has taken great steps to ensure the longevity of youth softball in the Roswell area. The complex sits on five acres of land and includes four fields that are used strictly for softball. The complex features a central, air-conditioned, two-story command center, which hosts the concession stands, restrooms and scorekeeping tower. The tower also features a deck for the Umpire-in-Chief (UIC), Tournament Director or other tournament officials to view games on all the fields. A lift is also installed in the command center, providing access to all levels for those who cannot climb the stairs. The Amateur Softball Association, founded in 1933, is the National Governing Body of softball in the United States and a member of the United States Olympic Committee. The ASA has become one of the nation’s largest sports organizations and now sanctions competition in every state through a network of 76 local associations. The ASA has grown from a few hundred teams in the early days to over 200,000 teams today, representing a membership of more than three million. For more information on the ASA, visithttp://www.asasoftball.com/. HUBBELL LIGHTING LAUNCHES UPGRADE PROGRAM FOR COMMERCIAL BUILDINGS ! Greenville, SC – October 3, 2013 – Commercial buildings represent over 80 billion square feet of space in the U.S. and consume 36% of all electricity, making them one of the largest generators of greenhouse gases. Hubbell Lighting today announced a new solution to cut electricity costs, enhance the quality of light and reduce the financial risk of upgrades–resulting in up to a 3% increase in net operating income while at the same time improving the property value and attractiveness for tenants. First is a suite of unique audit tools and other product selection resources, implemented shoulder-to-shoulder with Hubbell Lighting consultants. These allow building owners to precisely forecast the economic impact of various lighting retrofit strategies and also identify any utility rebates that are available. Second is the solution called “Compare in the Air,” where Hubbell encourages customers to validate those cost saving estimates in the building, selecting and installing up to four Hubbell Lighting products and monitoring the results for up to 90 days. After that trial customers can decide to keep the products or return them for a full refund. The createchange® program includes a comprehensive evaluation of the building, including office areas, halls, conference rooms, atriums, lobbies, restrooms, exteriors, parking garages and lots, and mechanical rooms. New lighting and control devices can dramatically reduce energy and maintenance costs. For example, in a 150,000 sq. ft. building that operates 24 hours a day, simply changing out 150 hallway 75 watt incandescent downlights to Hubbell Lighting’s LED fixtures will save a building owner almost $27,000 a year. With Hubbell Lighting’s Cash Flow Positive program commercial property owners can receive no down payment, 100% fixed rate, long-term financing usually approved in 24-48 hours that does not impact existing lines of credit or hinder their ability to borrow in the future. To learn more about Hubbell Lighting’s createchange® program for commercial buildings, visit www.hubbelllighting.com/solutions/retrofit/applications/. For Eagle’s sports park, bumps keep coming ! Amid conflict over terrain park plans, Ada County orders work stopped on a new bike trail. Earlier this year the city of Eagle and the Boise Area Mountain Bike Association started putting together plans to add a mountain bike trail at the Ada-Eagle Sports Complex off Horseshoe Bend Road. The city put up $30,000 and BAMBA raised $10,000. They hired Gravity Logic out of Whistler, B.C., to design the half-mile flow trail and contracted with 402Trails in Virginia to build it. Designed for riders of all abilities, the trail is to feature berms, rollers and other constructed features. The good news? Crews started work this week. The bad news? Ada County posted a stop-work order Tuesday. The problem? Ada County owns the park’s land. The county leases it to the city for $1 a year for use as a public park. But the city didn’t check with Ada County, the landlord, about building the half-mile mountain bike trail. Case says the lease agreement requires the city to get approval to change the contour or condition of the property. Under county code, any work done on slopes with 15 percent or higher grade requires review by the county engineer. Even though the county owns the entire park, some of the land has been annexed into the city and falls under city development rules. The portion of the park not annexed falls under county development rules. Trail construction was taking place on land under county jurisdiction, Case said. What does Eagle say? It doesn’t have to ask for the county’s permission. It says improving the park’s trail system is allowed under the lease agreement, and county code has an exemption for trails that do not exceed 5 feet in width. A letter that Eagle Mayor Jim Reynolds sent to the county Wednesday said the city spent $1.7 million on park improvements since 1998 and is slated to spend another $255,000 this year. “Your stop-work order is a direct assault on the city and the community’s efforts in improving the park,” Reynolds wrote. More conflict. Case said this is the second time this year the county has learned of Eagle making changes at the park without county input or approval. In August, the city approved a contract with a private business, Gateway Parks, to build a tubing hill/terrain park, including snowmaking equipment and a conveyer belt-style lift. The county said the city did not ask to install such equipment on county-owned property, and the first meeting between the two entities to discuss the project occurred after the city approved the contract. Case said the county didn’t learn about the bike trail construction until a few days ago. “We are trusting the city of Eagle to keep us informed,” Case said. What happens next? On Thursday, the county engineer will visit the site to review the bike trail plans. On Wednesday, the county commissioners and Eagle City Council will meet at 2 p.m. at the courthouse public hearing room to discuss the terrain park and the lease agreement at the sports park. Case said there are three options: Rework the lease agreement to allow for new uses; terminate the lease agreement; or have the city buy the land from the county. “My hope is we can all sit down and work this out,” Case said. Mistlin Park finances will improve ! Ripon, CA – The best appears yet to come for the Mistlin Sports Park based on a recent report. For the first time, a financial analysis on the complex was provided by Kye Stevens at Tuesday’s Ripon City Council meeting. “The numbers (consisting of expenses, revenue and projections) were conservative,” said the recreation director. The financial picture may not appear rosy at first glance. Take this year, for example. Expenses consisted of the fountain ($15,000), soccer fields ($200,391) and baseball fields ($70,000) at over $285,000 while revenue for soccer fields ($80,273), baseball fields $17,235) and concessions ($2,263) came to $99,771. According to the report, those assumptions were the sub-totaled amount for both expense and revenue. Assumptions also included 90 percent of the facilities being rented out. But the revenue for 2013-14 is projected to climb dramatically to over $187,000, taking into account completion of the new softball complex equipped with a restaurant-type concession stand. Stevens indicated that concessions up to now were limited to just beverages and a few packaged items. The new and improved concession, Stevens added, comes equipped with a deep fryer. “We can offer a restaurant menu,” he said. 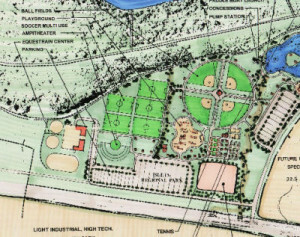 Cost projections for next year includes the fountain ($15,000), soccer fields ($204,807), baseball fields ($40,000) and the new softball fields ($40,000) as expenses tallying $299,807. Ted Johnston, who is the director of public works, noted that maintenance made up to what comes up to two full-time workers was the biggest expense. “It’s very labor intensive (to keep up the fields) particularly with the reduction in staff,” he said. 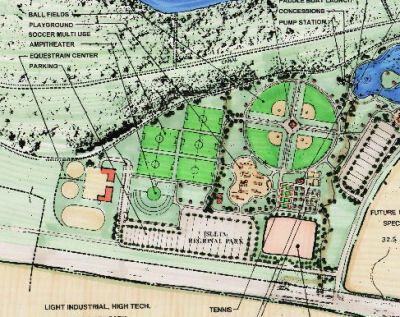 The soccer fields ($90,000), baseball fields ($35,000), concessions ($10,000) and softball fields ($2,500) – due to open by the spring – provided increased revenue projections. Those numbers could get even better by 2014-15 as concessions ($26,000) and the softball fields ($105,000) will be in operation for an entire year. “I think those numbers are skewered,” said Mayor Dean Uecker, who also took into account the money that’s generated in sales tax from gas, food, and lodging by out-of-towners going to Mistlin. Stevens agreed. “We’ve generated (money) above and beyond to the city,” he said. In addition, the city is exploring the possibility of attracting different sports such as lacrosse to Mistlin, Stevens said.